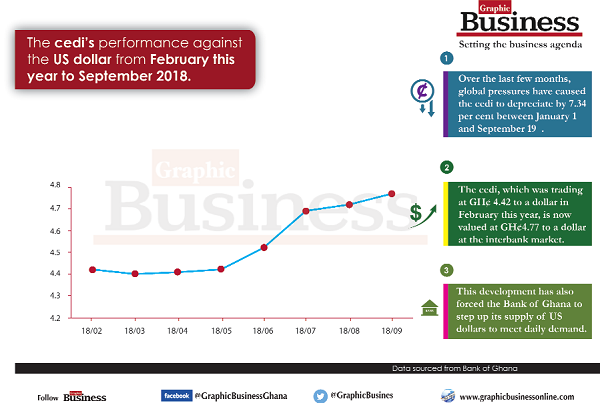 With the surge in dollarisation of the economy where many goods and services are now being charged in dollars, the Bank of Ghana (BoG) has admitted to do more to prevent businesses from quoting prices in the US currency and help save the cedi from further depreciation. Subsequently, the central bank is to strictly carry out the provisions of the Foreign Exchange Act 2006 (Act 723) beginning with a public sensitisation on the rules that constitute the act. “We will enforce the law because we are concerned about that so we intend to strengthen the communication on the rules relating to pricing for the industry,” the Governor of the BoG, Dr Ernest Addison, said in response to a question posed by the Daily Graphic during the Monetary Policy Committee (MPC) media briefing on September 24 in Accra. The intention of the BoG comes at a time when goods and services providers, both in the public and private sectors of the economy, are pricing in the US dollar without recognition for the country’s legal tender, the cedi. The worst culprits in this illegal act are real estate developers, private schools, automobile dealers, hospitality service providers, financial, architectural and legal consultancies, among many others. Ironically, while the BoG has failed to deal with the growing menace, one of the above-mentioned institutions deems it fit to pay its workers in the same foreign currency they charge from their customers. Dr Addison said although the BoG admitts that it needed to be proactive in enforcing the law that restricted businesses and individuals from quoting prices of goods and services in dollars, the underlining stability in the domestic currency was what would prevent people from using the US dollar to index themselves from the loss associated with the currency market. “Dollarisation becomes an issue when we have currency instability and people try to dollarise as a hedge against the loss in value of the local currency, so it’s important that we ensure that people obey the law and not quote in US dollars, but the most important thing is to work towards a whole stable cedi and then the incentive to dollarise will not be there,” he said. 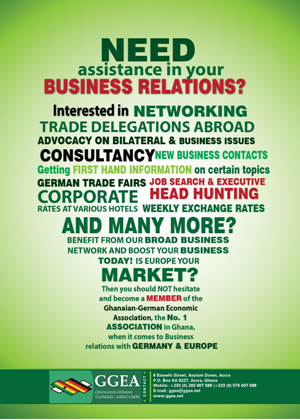 Invariably, the issues about dollarisation and its effect on the depreciation of the cedi have been related to foreign trade. For instance, some manufacturers in China insist on dollars as compensation for their goods, forcing local traders to scout for dollars from the currency market to import goods from China. That, according to Dr Addison, had thwarted the BoG’s efforts of stocking renminbi, the Chinese currency, to meet the demand for traders that went to China to buy goods. “The Bank of Ghana, as you’re aware, had a stock of renminbi to meet the demand for traders that go to China to buy goods. Unfortunately, even those who were buying goods in China preferred to carry dollars because the manufacturers in China themselves were asking for dollars. So it’s a very complicated matter which we’re looking at and trying to, maybe, join the Chinese payments arrangements. “If we can have access to the Chinese payments gateway, we’ll be able to encourage more correspondent banking relationships with some of the Asian commercial banks and thereby channel more of those transactions through the banks, rather than having people carry money on themselves to import from China,” he said. Some financial analysts have argued that the continuous dollarisation of the economy, spanning over a two-decade-long period, has resulted in the value of the cedi plummeting very rapidly against the US dollar and other major international currencies. A source who is familiar with the activities on the currency market told the paper in confidence that the BoG had no reason to sit aloof while individuals and businesses abused the law that it was mandated to enforce in the face of the continuous depreciation of the cedi. He said the continuous depreciation of the cedi, without clear strategies to avert it, could have a long-term consequence on the health of the economy. “The central bank must not get overwhelmed by the extent of the dollarisation but rather look at its long-term effect on the economy to crack the whip immediately,” he noted. An economic expert has also described the phenomenon as unfortunate and a clear demonstration of the lack of confidence in the economy and the local currency for that matter, a situation which they believe must be cured immediately before it gets out of hand.